Just when I thought things couldn't get much better this week. I mean BlogHer Food will have me in a daze for a while, I received a wonderful compliment in the form of The Sunshine Blog award from my friend Krista over at Everyday Mom's Meals! Krista and I met sometime ago through Facebook and our blogger family there. Instantly I fell in love with her with her caring heart and upbeat way of looking at life. She is quite an inspiration her self so for her to award me is an honor! 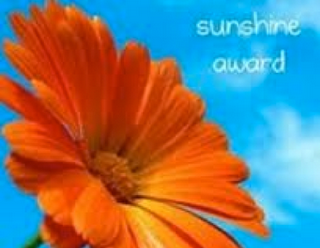 As Krista explained it, the Sunshine Blog award is an award given to bloggers by other bloggers. It is given to "bloggers who are positive and creatively inspire others in the blogosphere". How the award works, thank the person that awarded you and link back to their blog. Then answer 10 questions about yourself (it is nice to get to know each other better). Select 10 bloggers that inspire you and link back to them in your post and let them know they have been given the Sunshine Award. 2) Favorite animal? LOL I am a bit strange. I worked for Project Wildlife for many years and rehabbed many wild animals. I was also blessed to raise education animals for the San Diego Zoo as well as our organization. So my favorite animal is a possum. 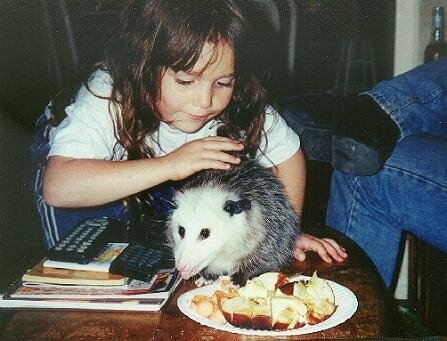 My daughter Jessi and our education possum Noel. 7) My passion? Cooking has become such passion for me since I lost weight. I say I used to live to eat and now I live to cook. I love nothing more than being surrounded by my family in the kitchen, talking and laughing, and serving them a great meal. 8) Giving or getting presents? Easily it is giving. I like to make presents. At the holidays I will make baskets for people with homemade cookies, candy, bread, jams, etc. 9) What is your favorite day of the year? I love Thanksgiving. There is something about a day of being around your family and friends to give thanks for everything you have in your life that makes me smile inside whenever I think about it. Now enough about me! Lets get on to the 10 bloggers I am awarding. This is so hard because there are so many wonderful people I could chose!! But here are 10 of them. Awww Thank you so much!!!!!!!!!! Thank you Bobbi! You are too kind!!!! You are so very welcome Steve! Thanks for being part of my foodie family!! Thank you so much! You've brighten my day after being sick all week. <3 and hugs darlin'! Awe, you are too kind. Thanks so much Bobbi. I really appreciate it. Love the possum, seriously cute. You are so welcome Kim :) Ya, I really miss Noel! !